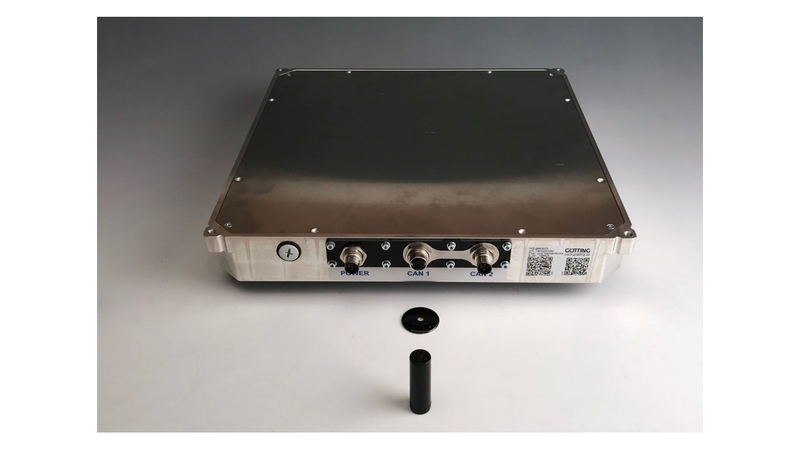 The antenna is used for the localization and track guidance of automated guided vehicles (AGV) or cranes. All settings, calibrations and software updates necessary for the operation of the antenna can be conducted via a serial interface or CANopen®. The antenna HG G-98830ZA uses a totally new antenna concept which enables an improved positioning functionality and higher accuracy than previous systems while also being more robust against metallic surroundings and more resistant to interferences. As soon as a transponder is underneath the active antenna area its code and deviation from the antenna center in X (direction of travel) and Y direction are output. In addition a high-precision center crossing pulse (positioning pulse) is generated in X direction when the transponder crosses the Y axis. The output format can be adjusted by the operator according to the requirements. Additionally the status and availability of both antenna and transponder can be output. As soon as a transponder is within the reading area of the antenna the antenna contactlessly induces energy into the transponder which in turn with this energy starts transmitting its code cyclically every 8 ms. Otherwise the transponder is totally passive and doesn&apos;t need an energy supply or battery of its own. The antenna uses the signal from the transponder to calculate the transponder&apos;s position in relation to the antenna&apos;s center. In order to calculate the orientation a series of transponders has to be read or a second antenna has to be used. With a second antenna it is also possible to calculate the orientation during standstill and to navigate omnidirectional vehicles. The interpreter that determines the code and the position is integrated into the antenna. When the Y axis is crossed a high-precision positioning pulse is output with a configurable duration.